My parents took me to church and Sunday school, but we rarely talked about God. 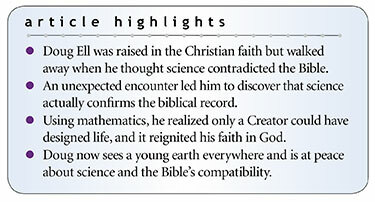 I loved to read, but the science books contradicted the Bible. I read of a universe that was billions of years old and of dinosaurs that supposedly lived many millions of years ago. I read of human descent from apes. The geology books denied Noah’s Flood. Without evidence, I concluded the Bible could not be true, and I drifted from God. I double-majored in math and physics at the Massachusetts Institute of Technology (MIT), studied theoretical math for three years, and got a law degree. During those years I considered myself an atheist. When my son was baptized at church, though, something happened in me—I felt the Holy Spirit. But the atheist indoctrination would not let go easily. I told myself I would not believe in God without evidence. That started my journey back to Him. I read books on physics, molecular biology, cosmology, quantum mechanics, and more. I began to see design in the world around me. The turning point came on an airplane. I did a crude calculation of the odds of getting a single functional protein by chance. The math was overwhelming; it can’t happen without God. I knew then God was real. It is a great joy to trust the Bible, to know it is true from beginning to end. In 2014, around a decade after my eureka moment, I published Counting To God: A Personal Journey Through Science to Belief. I “counted” through seven areas of science that point to God. Through a friend, I was able to launch the book with a lecture at MIT. But my journey was not over. Since the publication, my perspective on creation has changed even more. Just as I once was both ignorant and scornful of the evidence for God, I remained ignorant and scornful of the evidence for a young earth. I like to lecture on science and God. After one talk, a respected doctor invited me to examine the evidence for creation. He challenged me by saying, “At what point do you start believing the Bible?” In other words, if you take the position that the Genesis accounts of creation and Noah’s Flood are wrong but the gospel accounts of Jesus and His resurrection are true, where do you draw the line? Do you accept Abraham, Moses, and David? On what basis? I couldn’t answer these questions, and it troubled me. I was later invited to a private meeting with a creation scientist. I was impressed and promptly began devouring creation literature, including The Genesis Flood, Creation Basics & Beyond, Understanding Genesis, and A Flood of Evidence. I am grateful to ICR and all who work to spread the truth of creation and the Bible. I found creation everywhere. ICR’s Acts & Facts became my favorite magazine. I learned that blue stars, spiral galaxies, double stars, nuclear physics, and other evidence discredit the Big Bang model. I saw how DNA evidence shows all human beings descended from a woman who lived less than 10,000 years ago, and how one chart shows three branches of mitochondrial DNA corresponding to the three wives of Noah’s sons. Worldwide discoveries of dinosaur soft tissue opened my eyes to weaknesses in the old-earth perspective, as did detailed human drawings and carvings of dinosaurs. And I found the geological evidence of the Flood undeniable. It is a great joy to trust the Bible, to know it is true from beginning to end. I feel peace. I am grateful to ICR and all who work to spread the truth of creation and the Bible. With their help, my journey has led me back to God. * Doug Ell is a Principal at Groom Law Group in Washington, D.C. He earned an S.B. in mathematics and physics at M.I.T., an M.S. in theoretical math at the University of Maryland, and a J.D. (Doctor of Law) from the University of Connecticut School of Law. Cite this article: Douglas Ell, M.S., J.D. 2018. My Journey Back to God. Acts & Facts. 47 (11).